Percival (known as 'Percy') Bowlzer was born in Beeston, Nottinghamshire in 18982, the eighth of eleven children of Walter (b. 1856, Beeston) and Emily Bowlzer (b. 1860, Gloucester née Beard)3. At the time of Walter & Emily's marriage, Walter was working as a lace maker but soon afterwards they moved to Beeston where Walter found work as a storekeeper at the Humber Cycle works. By 1901, he and his wife and their then nine children were living at 71 City Road, Beeston4 where Walter and Emily were to live out their lives as did at least two of their children up to relatively recent times. In 1906, tragedy struck when Walter died, aged only 495 and leaving Emily with seven children of school age. By 1911, although three had left home, there were still four of school age - including the 13-year-old Percy at home6. From 1916 onwards, conscription into the armed forces had become compulsory for all single men when reaching the age of 18, and they would then be eligible to be sent abroad on reaching age 19. Accordingly, Percy should have enlisted in about September 1916 but, for some reason, seems to have done so around that time a year later, initially with the Notts & Derby Regiment7. By March/April 1918, at about the time he would have completed his training, the enemy launched its Spring Offensive from the Hindenburg Line with the objective of ending the war before American troops and resources could tilt the balance towards the Allies. The desperate struggle to stop the advance brought large casualties and, by April, 1918, the army was facing a desperate shortage of manpower on the Western Front. In the face of the resulting serious political crisis, the Military Service Act was extended to allow soldiers aged 18½ who had received six months training, to be sent overseas. It therefore appears that, having completed his six months training, Private Bowlzer was posted to 9th Battalion Essex Regiment and joined it in France - possible one of the 317 other ranks that were during April 1918 to replace heavy losses during desperate fighting in March and April. Further drafts continued to arrive in the following months8. On 8th August 1918, the battalion took part in an attack, part of what became know as the Battle of Amiens and , over the next few days, all objectives were reached and held, although not without substantial casualties. This was the beginning of what became known as the Allies' Hundred Days Offensive which was eventually to end the First World War. On 18th September, the battalion took part in what became known as the Battle of Epehy. This was an offensive against enemy forward outposts in front of the Hindenburg Line, Germany’s last line of defense on the Western Front. It faced extremely fierce machine gun fire before finely taking its objectives. Sadly, Private Bowlzer was amongst the many men killed on that day. Private Bowlzer was buried in Epehy Wood Farm Cemetery. Epehy is a village between Cambrai and Peronne about 18 kilometres north-east of Peronne which was captured at the beginning of April 1917. It was lost on 22 March 1918 after a spirited defence by the Leicester Brigade of the 21st Division and the 2nd Royal Munster Fusiliers. It was retaken (in the Battle of Epehy) on 18 September 1918, by the 7th Norfolks, 9th Essex and 1st/1st Cambridgeshires of the 12th (Eastern) Division. The cemetery takes its name from the Ferme du Bois, a little to the east. Plots I and II were made by the 12th Division after the capture of the village, and contain the graves of officers and men who died in September 1918 (or, in a few instances, in April 1917 and March 1918). Plots III-VI were made after the Armistice when graves were brought in from the battlefields surrounding Epehy and three smaller cemeteries. 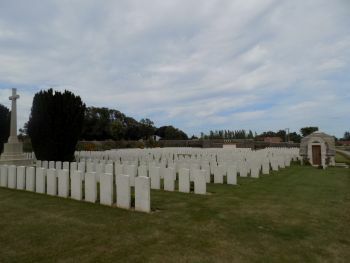 The cemetery now contains 997 burials and commemorations of the First World War. 235 of the burials are unidentified9. Private Bowlzer was posthumously awarded the British War Medal and the Victory Medal10. His financial effects of £3 11s 10d were paid to his mother, as his sole legatee. His War Gratuity of £3 was paid to her on 9 December 1919.11. Emily, his mother, died at the family home on City Road, Beeston on 27 June 1935, aged 7412. 2His birth was registered in Basford Registration District (of which Beeston was part) in Q4/1898 (Ref 7b 193). Although no record of his precise birth date has been found, his baptism at Beeston Parish Church on 21 September 1898 means that he must have been born on or before that date. probably early in September with registration falling into the next quarter, but still within the 42 day limit. 3They were married at St James' Church, Gloucester on 19 June 1880. Percy's siblings were John Whitworth (1880-1944), Charles Henry Walter (b. 1883), Horace (1885-1962), Francis (1888-1973), George Arthur (b. 1891), Edith (1893-1955), Laura b. c1895) Harold (1900-1964), Amy (1903-1994) and Bertie (1905-1980). 5Walter's death was registered in Basford Registration District (of which Beeston was part) in Q3/1906 (Ref 7b 110). 6Beeston, Notts: 1911 Census, Piece 20431, RD429, SD3, ED6, Sched 234. 7His Army Service Record has not survived but the amount of his War Gratuity can be used to calculate the month of enlistment. In this case, the minimum amount of £3 was paid which equates to a period of service of not more than 12 months. This tends to indicate that he was aged 19 when he enlisted. His early service with the Notts & Derby Regiment, with a Service Number of 11640 is recorded in his entry in 'Soldiers Died in the Great War'. 9Details the battalion's deployment in 1918 is from the battalion war diary. 10Details from Percy's Medal Card and his Medal Roll entry - available on ancestry.com. 11Details from his entry in the Army Register of Soldiers' Effects, 1901-1929 - available on ancestry.com. 12Death Notice - Nottingham Evening Post : 29 June 1935.